Seoul Music Awards has announced details of the ceremony, nominees for fan-voted categories and more. The prestigious 28th Seoul Music Awards has revealed to be held at Gocheok Sky Dome on January 15 at 7pm KST. The event will be covered live by KBS Drama, KBS Joy, KBS W and BBangya TV. The award show was founded in 1990 and presented annually by Sports Seoul for outstanding achievements and for excellence in music industry. The awards are based on numerous albums released during the year, combined with 30% of mobile votes and 40% of digital downloads and album sales, besides 30 percent judges' scores. 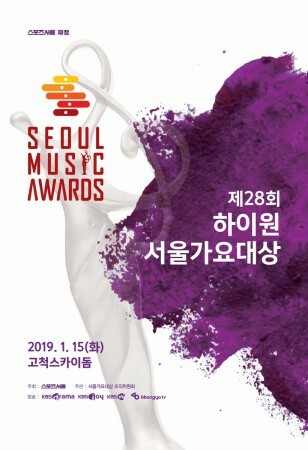 The Seoul Music Awards will recognize the Grand Prize, Best Album, Best Sound Source, Rookie of the Year, Best Ballad, Best OST, Best R&B, Best Hip Hop, Best Trot, Best Band, Popularity Award, K-Wave Popularity Award, Show & Culture Award, Discovery of the Year, Dance Performance Award, the Fandom School Award and the Main Awards. Apart from the Main Awards, Rookie of the Year Award, Popularity Award and K-Wave Popularity Award, all the other winners will be solely determined by the Seoul Music Awards committee and panel members. The Seoul Music Awards has a long standing reputation of being the most famous and popular K-Pop festival in Korea. The award show is dubbed as "Korean Grammy Awards" by K-pop fans across the globe. The "Muse Trophy" symbolizes the growth of Korean music industry over a quarter century with the golden lady proudly holding a musical note. Here's the list of eight awards, not restricted by genre, and three awards one each in trot, hip hop, R&B. Daesang Award (Grand Prize), or Artist of the Year, is given to the best artist from among 12 artists finalized by album and digital sales, online vote and a final choice by the judges. Bonsang Awards (Main Prize) is awarded to up to 12 artists by calculating album and digital sales with online vote and a final judgement by the jury. Record of the Year, or Best Album is presented to the best full-length album. Record of the Year in Digital Release is given to the best single in digital release. New Artist Awards are presented usually to three new performers in each year. Performance Award is awarded to best live performer. Trot Award is given to the performer of trot music. Hip Hop/Rap Award is awarded to the hip hop music/Rapping music performer. R&B/Ballad Award is presented to the R&B/ballad music performer. OST Award is awarded to the top performer of the original soundtrack (OST) from drama/movie/TV program. Popularity Awards are awarded to to two top performers who gained popularity and they are chosen by online voting. The nominee pool from the Bonsang and the Newcomer awards is taken into account. Hallyu Special Award is awarded to the most popular performer around the world during the year. The Seoul Music Award offers a chance for K-pop fans to participate in voting for their favorite stars. The much awaiting popularity vote amounts to 30% for each Main prize and Rookie of the Year Award based on votes from domestic and international fan base. The voting period starts from 29th November 2018 12pm to 11th January 2019 until 12 am Korean Standard Time.